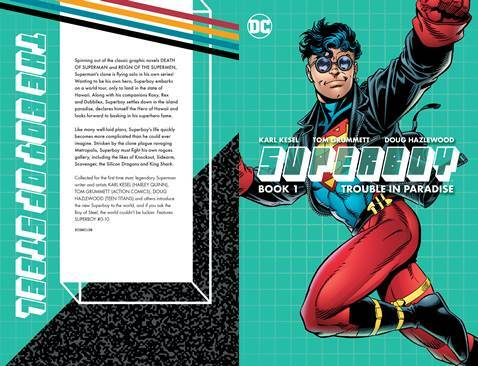 Spinning out of the classic graphic novels DEATH OF SUPERMAN and REIGN OF THE SUPERMEN, Superman's clone is flying solo in his own series, SUPERBOY BOOK ONE: TROUBLE IN PARADISE! Collected for the first time ever, Superman writer and artists Karl Kesel, Tom Grummett, Doug Hazlewood and others introduce the new Superboy to the world, and if you ask the Boy of Steel, the world couldn't be luckier. Wanting to be his own hero, Superboy embarks on a world tour only to settle in the state of Hawaii. Along with his companions Roxy, Rex and Dubbilex, Superboy settles down in the island paradise, declares himself the Hero of Hawaii and looks forward to basking in his superhero fame. Like many well laid plans, Superboy's life quickly becomes more complicated than he could ever image. Stricken by the clone plague ravaging Metropolis, Superboy must fight his own rogues gallery, including the likes of Knockout, Sidearm, Scavenger, the Silicon Dragons and King Shark.